Introduction: The lack of appropriate instrumentation is a potential obstacle to the feasibility of various NOTES procedures. A Rotary Access Needle (RAN- Ethicon Endo-Surgery, Inc.) and Steerable Flexible Trocar (SFT- Ethicon Endo-Surgery, Inc.) were developed as components of a Flexible Toolbox for Advanced Minimally Invasive Procedures to facilitate transgastric access, visualization, and procedures in the abdomen. This study is an initial assessment of the safety, feasibility, and efficacy of these devices during transgastric peritoneoscopy in obese patients undergoing laparoscopic Roux-en-Y gastric bypass. Methods: After obtaining IRB approval, 6 morbidly obese patients with a history of previous intra-abdominal surgery with plans to undergo laparoscopic gastric bypass were enrolled for laparoscopic-assisted transgastric peritoneoscopy. After laparoscopic access was obtained, the SFT and endoscope were introduced into the gastric lumen. Transgastric peritoneal access was established using the RAN device. The SFT and endoscope were advanced through the gastrotomy into the peritoneal cavity and peritoneoscopy was performed. If adhesions were present, endoscopic transgastric adhesiolysis using flexible instruments was performed. End points recorded were the time to enter the peritoneal cavity, the ability to visualize each quadrant of the abdomen, the ability to perform adhesiolysis, and complications. This study is part of an ongoing Food and Drug Administration/Investigational Device Exemption (FDA/IDE) study of the Ethicon Endo-Surgery, Inc. Flexible Toolbox. Results: Five females and 1 male (mean BMI 46.4 ± 8.4) were enrolled. Successful transgastric access using the RAN was performed in 5 of 6 patients. In 1 patient, the NOTES procedure was aborted due to difficulty in creating the gastrotomy. Total mean operative time for the entire procedure (NOTES procedure + laparoscopic gastric bypass) was 108.1 ± 11.4 min. The mean operative time for the NOTES procedure was 29 ± 5 min and the mean transgastric peritoneal cavity access time was 18.6 ± 6.5 min. All 4 quadrants of the intra-abdominal cavity were visualized and accessible with the endoscope using the SFT. We performed transgastric adhesiolysis in 2 patients. One patient had a cervical esophageal laceration following passage of the SFT and endoscope with an uneventful recovery requiring no further treatment. Conclusion: The Ethicon Endo-Surgery, Inc. 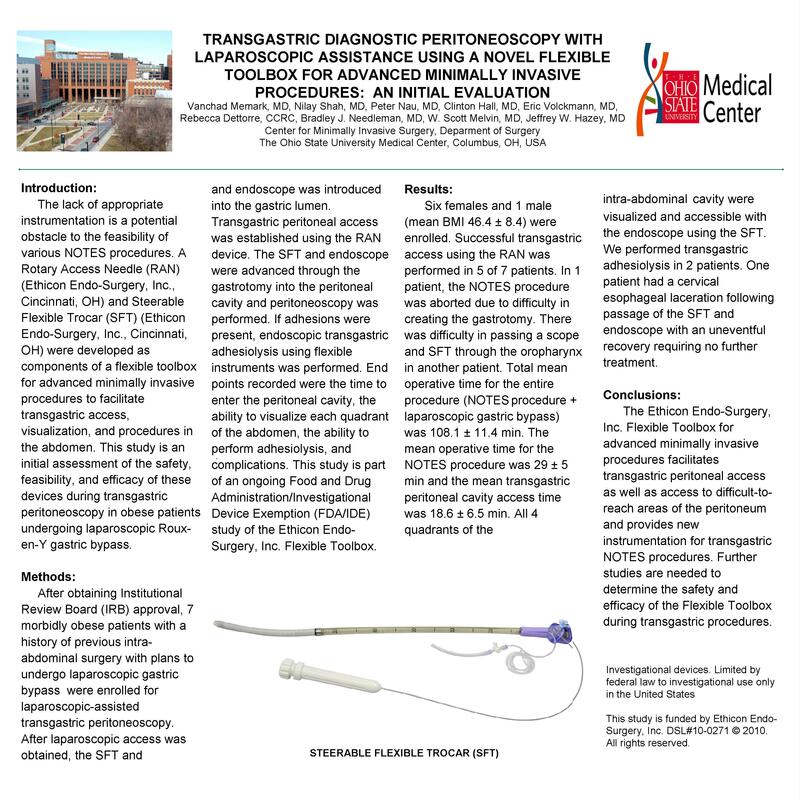 Flexible Toolbox for Advanced Minimally Invasive Procedures facilitates transgastric peritoneal access as well as access to difficult-to-reach areas of the peritoneum and provides new instrumentation for transgastric NOTES procedures. Further studies are needed to determine the safety and efficacy of the Flexible Toolbox during transgastric procedures. Investigational devices: Limited by federal law to investigational use only in the United States.